A common complaint we hear from our patients is that they are looking for answers on how to get rid of a double chin. 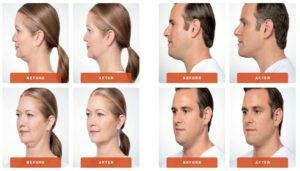 KYBELLA is the first and only non-surgical treatment approved by the FDA to improve the appearance of moderate-to-severe submental fat – also known as a double chin. Administered in the form of a fat-dissolving injection, these treatments yield much less downtime and offer a non-surgical alternative to reducing the fullness in submental fat. KYBELLA injections shape your lower face by eliminating fat, resulting in a more defined chin and jawline*. The injections are administered under the skin, directly into the area beneath the chin. Made from deoxycholic acid which is naturally produced in the body to help absorb fats, KYBELLA destroys fat cells when injected directly into fatty tissue. When injected properly, this leaves all other cells healthy and intact, though Dr. Soine strictly recommends not using this treatment on areas other than the double chin. Dr. Soine creates a custom treatment plan for each patient depending on the amount of submental fullness exhibited. Each treatment session takes about 30 minutes. After numbing the area with a topical agent, the Dr. Soine will inject Kybella into multiple sites under the chin. Some patients see optimal results within just two to three treatments, though this varies from patient to patient. It is possible to need up to six treatments, which are spaced four to six weeks apart. These treatments are indicated for both men and women, and once desired results are achieved, additional treatment is not expected to be required. Because Kybella destroys the fat cells under the chin, additional sessions are unnecessary and highly unlikely the double chin will re-occur. Currently, the only effective alternative to KYBELLA is a plastic surgery procedure, such as liposuction with or without a chin lift. However, these procedures are invasive, painful, have longer recovery times, higher risk of complications, and are very expensive. KYBELLA is a safe alternative to surgery, with common side effects that can include temporary redness, swelling, slight bruising, and slight pain at the injection sites. If you have been wondering how to get rid of a double chin and want to do something about it safely with little to no downtime, schedule your appointment with Dr. Soine, today! Soine Dermatology & Aesthetics is based in Covington LA, but also serves the entire Northshore area including Mandeville. * Individual patient results may vary.